A talent on the rise, Jimmy Butler appears to be the star player that the Chicago Bulls were hoping to pair with Derrick Rose. His breakout 2014-15 season has caught the attention of the hobby and Jimmy Butler rookie cards are trending upward as that production has continued into 2015-16. 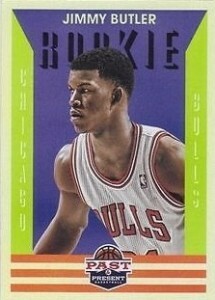 Shop for Jimmy Butler rookie cards on eBay. Basketball ability aside, Jimmy Butler's childhood story is quite remarkable. View a detailed account here. After overcoming this rough period in his life, Butler attended a junior college in Texas before transferring to Marquette University. This was the point where Jimmy Butler started to get strong recognition for his play on the court. After three years at Marquette, Butler entered the 2011 NBA Draft where he was selected 30th overall by the Chicago Bulls. Coming off the bench for the Bulls, Jimmy Butler's rookie season took place during the 2011-12 season that was shortened by the lockout. Butler saw more minutes the following season and by 2013-14, he was the starting shooting guard. His true transformation came in the 2014-15 season and saw him put up career highs in most statistical categories and also add hardware in the form of the Most Improved Player Award and an All-Star appearance. While Jimmy Butler's rookie year came in 2011-12, his official rookie cards were not released until 2012-13 products because of the lockout. 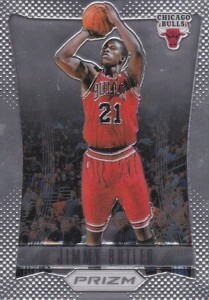 However, collectors could still find redemptions for his pre-rookie cards in several 2011-12 products. Found only in Panini products, Jimmy Butler's 2012-13 rookie options feature a good mix of designs and price points. Marquee, which features five different cards, and Prizm are two of the most popular base rookie cards for Butler that can be found for reasonable amounts. Among his many premium options, National Treasures and Immaculate offer the most valuable rookie cards for Jimmy Butler. Preferred is also a great place to look for on-card autographs. 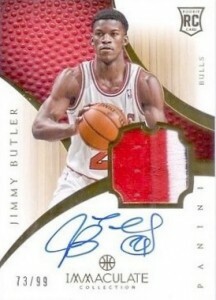 Check out the full checklist for Jimmy Butler rookie cards below. Click on the listings to shop for singles on eBay.